The Great Solar Eclipse is just hours away in North America and millions of people have their special solar glasses at the ready. But chances are, many millions more don't. After all, they made just a certain number and you might be among the many who didn't get a pair. Under no circumstances should you look directly at the eclipsing sun without the protection of certified glasses or filter. Doing so will cause significant and permanent eye damage. Even really good sunglasses offer no protection. However, there is a way to safely experience the spectacle, by making a device that will allow you to view the eclipse indirectly. By taking a piece of cardboard and cutting a small round hole in the center, you can hold it up to the sun and the hole will be filled with sunlight. Hold a sheet of white paper about 12 inches away from the cardboard and the circle of sunlight will be projected onto the white paper. As the moon begins to pass across the sun, you will see the circle of light begin to turn dark. A slightly fancier way to produce a homemade viewer is by using an empty cereal box. The folks at Kellogg's produced the brief video below to show how it's done. It goes without saying you can also experience the eclipse online, which might be helpful if you happen to be far outside the "zone of totality," which stretches across the center of the country. 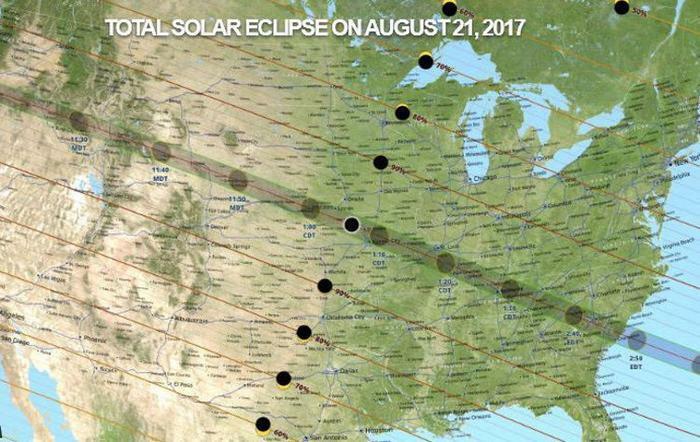 National Geographic says it is offering a full day of coverage of the eclipse, with visuals from the "zone of totality," along with live commentary.